Exeter's crematorium and the approach golf course of Northbrook Park occupy the former land of the Northbrook Park estate. The whole 31 acre estate was owned by John Dawson in the late 19th-century. In 1894, Percy Sladen, Dawson's nephew became more involved in family affairs, and in the management of his uncles estate. He inherited the estate at his uncle's death in 1898 and moved into Northbrook Lodge, the main house. Northbrook Lodge became a civil defence headquarters after the May 1942 blitz, largely because it still had electricity, supplied from Sladen's hydro-electric generator at Countess Weir mill. In 1946 the lodge was compulsorily purchased from Mrs Kerr, a distant cousin of Sladen's wife and converted into flats. In 1954 it was demolished and the western 14 acres of the estate became the site of the crematorium; the fountain in the memorial park is right in front of the former site of Northbrook Lodge. The crematorium isowned and managed by Dignity Plc. 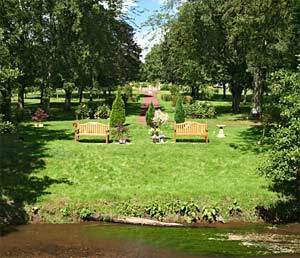 It opened in 1963 and includes a garden of rememberance that runs down a gentle slope to the Salmon Pool leat. The eastern half of the estate became the Northbrook Golf Course which is run by DC Leisure, again, for the city council. It is a par 3 course where you can just turn up and play. Many a happy hour can be passed trying to avoid the North Brook that runs through the centre of the course. During the drought of 1976 the ground was so hard that play became impossible on the sloping parts of the course as the ball would instantly run down hill. The Northbrook, which is four miles long rises near Little Gratnor field, Stoke Hill. It then flows down the valley through Polsloe as the Mincinglake Brook or Whipton Brook, and was locally known as 'The Panny'. 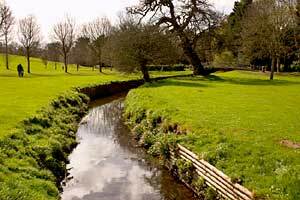 The lower length has been variously known as the Wonford Brook or Wonbroke and Northbrook. It flowed under Heavitree Bridge and across the Topsham Road on its way to the Exe. Sources: Biography of Percy Sladen by David Nichols and published by the Linnean Society, Express and Echo and Dignity Plc. Northbrook Park - the water hazard! The Garden of Remembrance at the Crematorium.